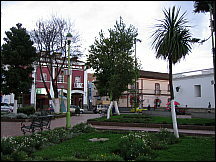 Riobamba is the capital of Chimborazo Province in central Ecuador, which is located at the Chambo River Valley of the Andes. It's 200 km (125 miles) south of Ecuador's capital Quito and located at 9,000 feet (2,700 m) on the Avenue of the Volcanoes. 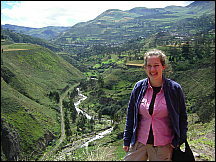 The city is surrounded by mountains and volcanoes, and while sitting at the foot of the volcano Chimborazo, one gets the world’s highest view from the center of the Earth. 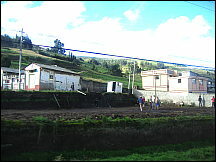 The economy of the city mainly focuses on the agricultural production of the surrounding local populations. Besides this, Riobamba has an open-air market where indigenous artisans display their wares, where people can find manufactured products as textiles, handicrafts, leather goods, beer, and dairy products. 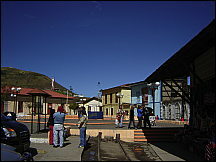 Riobamba is also an important trade center of cattle-ranching. 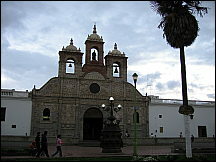 Riobamba is an important historic and cultural landmark of Ecuador. 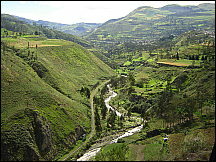 The region was a Puruhá Indian territory before it was conquered by the Incas during the late 15th century. 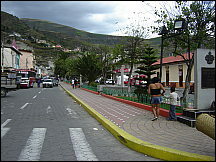 It was the first city founded by the Spaniards in what is now Ecuador, founded in 1530. 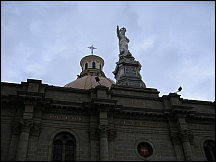 In 1563 the city became part of the Spanish Empire's newly-formed Royal Audience of Quito. 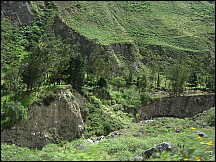 Known as the “Sultan of the Andes”, Riobamba was completely destroyed by an earthquake in 1797, but rebuilt a few years later 14 km (9 miles) away from its original location, near a village named Cajabamba. 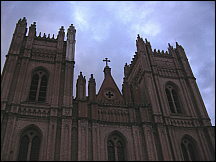 The city still retains a great architecture from the Spanish period. 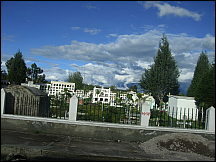 In the struggle against Spanish rule Riobamba first declared independence on November 11, 1820 but was soon retaken. 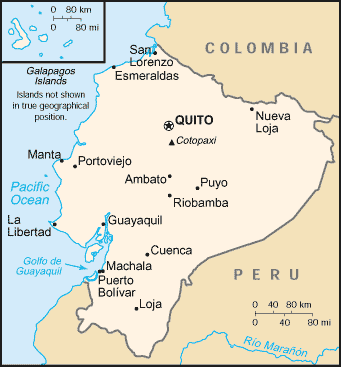 The city finally became part of an independent Gran Colombia in 1822, and then a separate Republic of Ecuador in 1830. 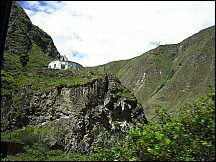 Nariz del Diablo. 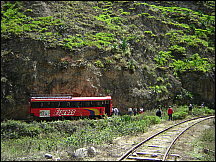 La Nariz del Diablo (devil's nose) is a train route in Ecuador. 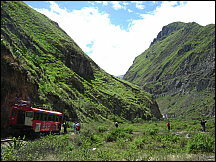 It leads from Riobamba (2,754 m) and Alausí (2,360 m) over the Andes after Simbambe (1806 m) through all climate zones of the country. 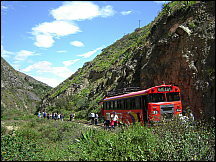 The most famous piece is part of the "Devil's Nose," an approximately 100-meter-high cliff over the gorge of the Rio Chanchán. In order to overcome these rocks, the tracks have been carved and laid in the steep wall of the Devil's Nose back and forth in a zig-zag fashion. 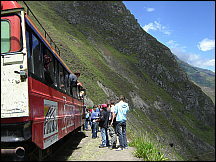 The train goes forward then backward up the zig and zags changing altitude, several hundred meters of altitude in a few minutes. 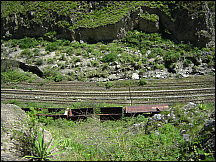 The line was built between 1899 and 1908 as a masterpiece of engineering. Today, the train is a tourist attraction, especially as the possibility exists, to ride on the roof of the train. 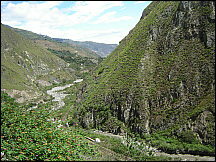 Free pictures along the road between Baños and Ambato, Ecuador. 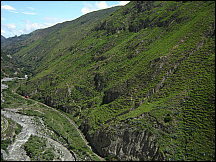 Free photos of Baños and Ambato and adjoining areas are separate. 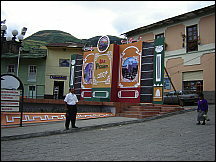 Riobamba es una ciudad en Ecuador, conocida también como: “Cuna de la Nacionalidad Ecuatoriana”, “Sultana de los Andes”, “Corazón de la Patria” por su historia y belleza, es la capital de la provincia de Chimborazo. Se encuentra en el centro geográfico del país, en la cordillera de los Andes, a 2.754 msnm, cerca de diversos volcanes, como el Chimborazo, el Tungurahua, el Altar y el Carihuayrazo. 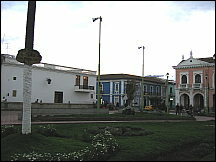 La ciudad fue fundada en 1534 cerca de la laguna de Colta. Posteriormente se trasladó hasta el lugar que ocupa hoy en día. Durante un breve período, tras la fundación de la República del Ecuador, fue la capital del país. Según el censo de población de 2001, la ciudad tenía 124.808 habitantes y 209.830 habitantes todo el cantón. La superficie delimitada por el perímetro urbano de la ciudad es de 2.812,59 hectáreas. Existen varios universidades, colegios y escuelas. 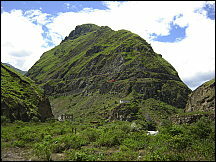 La Nariz del Diablo (englisch „devil’s nose“, deutsch „Teufelsnase“) ist eine Zugverbindung in Ecuador. 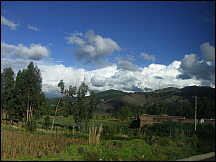 Sie führt von Riobamba (2.754 m) und Alausí (2.360 m) über die Anden nach Simbambe (1.806 m) durch alle Klimazonen des Landes. Das berühmteste Teilstück ist die „Teufelsnase“, ein rund 100 Meter hoher markanter Felsvorsprung, der über der Schlucht des Rio Chanchán aufragt. Um diesen Felsen zu überwinden, wurden die Gleise in der steilen Wand der Teufelsnase fast übereinander gelegt und durch mehrere Spitzkehren miteinander verbunden. Der Zug bewältigt so in wenigen Minuten mehrere 100 Höhenmeter. Die Strecke wurde zwischen 1899 und 1908 gebaut und galt damals als ein Meisterwerk der Ingenieurskunst. Heute ist die Zugfahrt eine Touristenattraktion, zumal die Möglichkeit besteht, auf dem Dach des Zuges mitzufahren.